At Maggie & Ellie's we think life is better with a little sparkle. We want you to step outside your comfort zone, have fun, and laugh a lot. Maggie & Ellie offers more than 150 shapes of unfinished pottery. We provide you with an extensive design center including stencils, stamps, and idea books to create your own unique piece of pottery. It's not just for birthdays and its not just for kids. Whether you're 6 or 106, Maggie & Ellie's is the perfect place for your next event. Our beautiful party room will give you some privacy but you will still feel a part of the atmosphere. Contact us to schedule your party. Maggie & Ellie's offers a large selection of high quality glass materials. 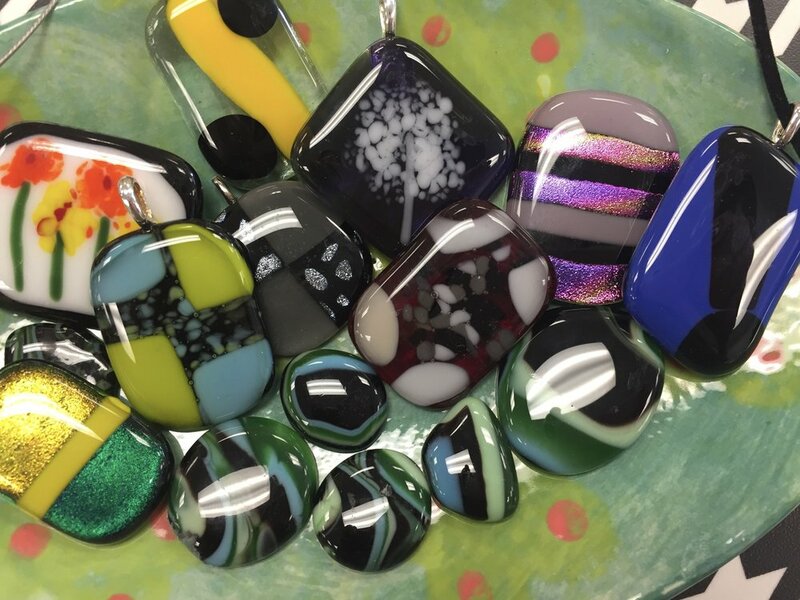 We provide you with instruction on how to create an exceptional glass piece that will rival anything you could buy at an art show. Enjoy this unique opportunity to take home a beautiful glass piece, made by you. Board art (or sometimes referred to as sign painting) is a popular new art form decorating homes, offices and businesses everywhere. Sign up for one of our classes or just stop in. We’ll guide you along. We have more than 100 stencils to choose. Allow yourself at least two hours if you are creating a board on a walk-in basis. We now offer canvas painting on a walk-in basis. All of our canvas painting is self-guided. You pick the design, we give you the canvas, a template to trace onto the canvas and written painting instructions. There is something for everyone and you’re not all locked in doing the same design. Choose from our nearly 200 different designs (kids and adults). Allow at least two hours to paint. Maggie & Ellie's is located at 15155 Pearl Rd. in the Strongsville Towne Center Plaza. We are in the same plaza as Big Lots, near Citizens Bank and Platos Closet. We are directly behind Five Guys and Sprint!